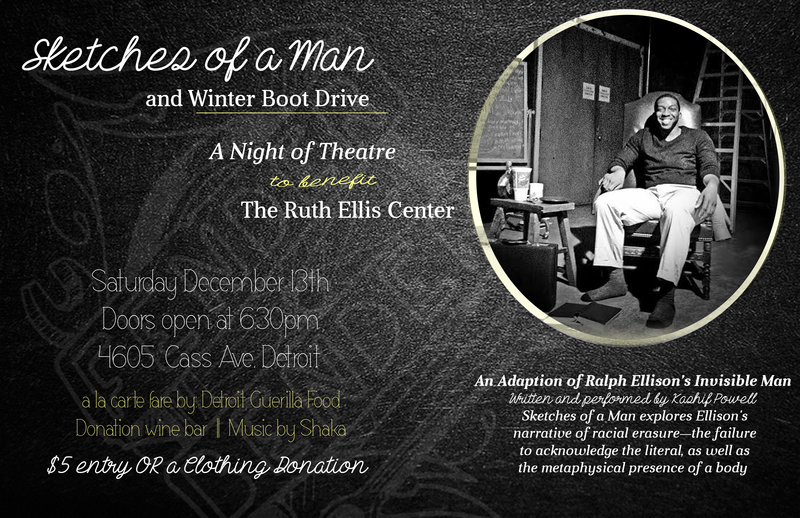 This night of theatre is a benefit for The Ruth Ellis Center and affiliated youth, hosted by Fender Bender Detroit. The mission of the Ruth Ellis Center is to provide short-term and long-term residential safe space and support services for runaway, homeless and at-risk gay, lesbian, bi-attractional, transgender and questioning youth. In the prologue of Invisible Man, Ralph Ellison sketches the uncanny force of Louis Armstrong’s music to “make poetry out of being invisible.” In the chapters that follow, Ellison’s protagonist becomes the embodiment of those poetics as he journeys the world, unseen. Sketches of a Man explores Ellison’s narrative of racial erasure—the failure to acknowledge the literal, as well as the metaphysical presence of a body. Kashif Powell appeared has appeared in numerous roles, including Stokely Carmichael in The Parchman Hour (Playmakers Repertory Company) and Supreme Intellect in the superhero romp Jade City Chronicles. His portrayal of Ogun in The Brothers Size (Manbites Dog Theater) was called a “towering performance,” by the Raleigh News and Observer. Powell is a postdoctoral fellow in African American Studies and Performance Studies at Northwestern University. A la carte menu by Guerilla Food Detroit, with a donation wine bar to benefit The Ruth Ellis Center. D. Blair Theater, Cass Corridor Community Commons, 4605 Cass Ave, Detroit, MI. Doors open at 6:30, the show begins at 7:00pm. DJ Shaka & a mixer after the show. $5 entry; or a Winter Boot Donation for street-affiliated Queer youth.